This month we respond to the oft-heard conjecture that lifting overhead is inherently dangerous--i.e., that it is destructive of the shoulder. Conjecture, by definition, is required neither to comport with fact nor to offer testable proposition, and, as such, it is a ready vehicle for those limited in the skills, focus, or desire required to give thoughtful examination on any topic. (See "Conjecture, Hypothesis, Theory, Law" in CrossFit Journal 64, December 2007.) "Squatting is bad for the knees," "lying down after a workout is dangerous to the heart," "swimming shortly after eating causes drowning," and "overhead lifts are bad for the shoulders" are all conjectures unsupported by data, untested by experimentation, and at odds with fact, yet each has at one time or another been offered as "common knowledge" in athletic communities. Additionally, proving the non-existence of anything is fraught with logical difficulty. If you claim to be in possession of a unicorn, for example, by what process am I to prove the falsity of your claim? The point is that the burden of proof for conjecture lies with those who offer it, not those who are witness to it. No response ought to be required of conjecture until it is supported by data and experimentation--that is, until it is presented as a hypothesis and subsequently elevated by experimentation and data to become a theory. This is a simple protocol of rhetoric required by logic and practicality. Yes, dead or corrupted link/PDF. PDF downloads, only a few bytes in size. I paid for a year membership of the journal last month so this was suppose to be my first. I'll appreciate it if you guys can get this fixed soon. If shrugging puts the shoulder in the safest and strongest position, does that mean we should shrug right from the rack position or is the shoulder blade positioning only an issue at the top? Maybe I'll re-read the article too. What a classic, "prove me right. no, you prove me wrong" argument. Your argument for the overhead press assumes that the participant's musculoskeletal system is optimal. The fact is, that in today's society, where the majority of our population exhibits forward head posture, rounded shoulders, and anterior pelvic tilt. I'm embarrassed for the medical doctor that contributed to your unilateral argument towards the safety and efficacy of an exercise. It's like dispensing medication without paying any attention to age, weight and comorbidities. While the article by Rippetoe, Kilgore and Starrett was interesting and informative, it provides no supporting references nor hard data, nor has it been subject to the process of peer review (attaching letters of testimony from true believers doesn't count). As such, it lies somewhere between conjecture and hypothesis supported by hearsay. What is troubling, however, is that Glassman has presented this material in a form that misleads readers into thinking it has been subject to skeptical inquiry and testing, and in so doing raises the question of whether his zeal has outpaced his professional ethics. The postural issues that occur are easily remediated by cueing the client to assume a neutral postural alignment prior to the execution of an overhead technique. 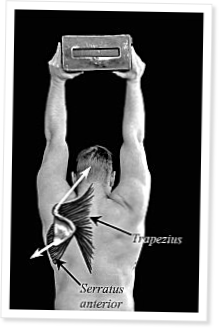 Overhead lifting is an exellent way to correct postural issues. Your analogy isn't quite right, either; anthropometric and physiologic differences between clients will not neccesarily preclude one client from not doing overhead work over another, only clearly inhibitive dysfunction can and in that case nobody is suggesting that overhead work be done. Eric, I suppose you missed the physical therapist's contribution to this article. And the data was pretty hard AND convincing. Kilgore has a PhD in the field. What IS troubling is that YOU think that it has mislead readers into thinking that this material has been subject to inquiry, which is not the same thing. Besides, the contents of Coach Rip's contribution have been published in other people's biomechanics text's before. As an intern in chiropractic manual therapy I spend much of my time improving the extensibility of tissues that limit overhead pressing, and then engaging the patient in overhead presses. I restore the range, then increase the capacity. You are correct: our modern lifestyle predisposes many to postural distortions but these are not entirely irreversible. Rounded shoulders are NOT a contraindication for pressing, in fact the opposite is true. One must increase their ability to achieve the safe overhead position, which includes lateral glenohumeral rotation, glenohumeral abduction, and lateral scapulothoracic rotation and elevation. If I have a 55 year old executive who has spent the majority of his life in a suit coat, I will have to stretch and manipulate the tissues to achieve this position, then have him press weight through that range. If I have a young child with poor posture (appearing in great numbers unfortunately) often their tissues will not be restricted, and simple instructions on how to press correctly are all that is needed. Amazingly, a regular routine of pressing squatting and lifting will improve the posture and mobility of both individuals. The "you prove me wrong argument" works in this case. The natural state of human existence is overhead pressing, squatting, and lifting and NOT chair-sitting, computer-typing, and mouse-scrolling. Therefore, when people return to correct pressing, squatting, and lifting their musculoskeletal aches, pains, and dysfunctions disappear. Posture is largely transformable, and is not a reason to disregard this article. A correction: "Rounded shoulders are NOT a contraindication for pressing, in fact the opposite is true" was meant to read "Rounded shoulders are NOT a contraindication for pressing, in fact they improve with overhead pressing"